Rutgers-CAIT Author(s): Franklin Moon, Ph.D. External Author(s): Nagnath (Nat) Kasbekar, P.E. THMPER could revolutionize how bridge load ratings are determined. Photo ©Drew Noel Photography/Rutgers CAIT. 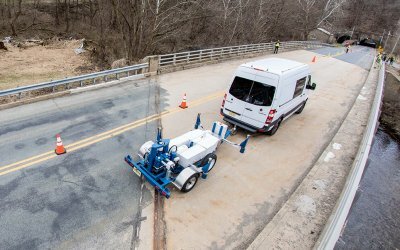 THMPER's impact trailer and sensors do onsite testing faster and more accurately than traditional methods, and with less traffic disruption. 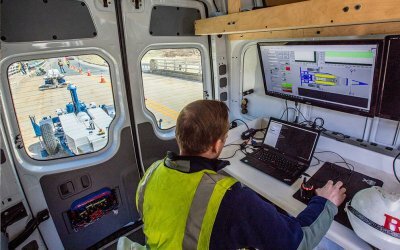 Its rolling “control center,” and custom software suite record the bridge’s response and process test data on the spot. Photo ©Drew Noel Photography/Rutgers CAIT. 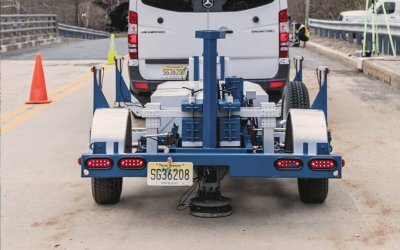 The Targeted Hits for Modal Parameter Estimation and Rating (THMPER) system is a rapid modal impact trailer, a mobile work station, and streamlined data processing software that is used to extract modal parameters (natural frequencies and global mode shapes) of highway bridges during brief traffic slow downs or partial lane closures. The modal testing trailer is comprised of a Falling Weight Deflectometer (FWD) that was significantly reconfigured to (1) provide a single, large (~30kip) broadband impact source, and (2) collect the resulting free-decay response of the bridge’s surface both locally (at the impact location) and globally (via wireless, GPS synchronized stationary sensors installed along available sidewalks/shoulders out of the way of traffic). Once collected, the data is ported to a semi-automated modal processing software which performs (1) data quality checks, (2) frequency response function development, and (3) modal parameter estimation. The proposed research aims to validate this emerging technology using a typical highway bridge as a test specimen through a three tiered comparison with current “best practices” approaches. First, the THMPER system’s effectiveness as a modal testing approach will be assessed through a comparison of modal parameters obtained from a conventional modal test. Second, a finite element model calibration will be performed and compared using results from the THMPER system and from a conventional truck load test. Finally, a Load and Resistance Factor Rating will be obtained from each finite element model and compared.